The Disney Gift Card offers thousands of magical possibilities. There’s no better way to recognize achievement, thank clients or reward top performers than with the magic of Disney. Gift cards can be used for most everything Disney – from once-in-a-lifetime vacation experiences at the Walt Disney World® Resort in Florida, Disneyland® Resort in California, Disney Cruise Line®, and Adventures by Disney, to merchandise at Disney Stores in the U.S., shopDisney.com and beyond! Designed for maximum flexibility, Disney Gift Cards are available for bulk purchases in varying increments from $15 to $1,000. Give the gift of Magic! 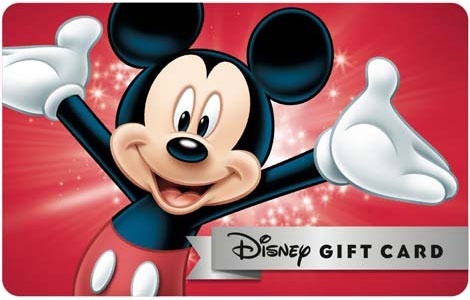 National Gift Card is the best place for you to order Disney Gift Cards in bulk. We are the experts in all things gift cards and can set up your gift card solutions program for you today. Please contact us for more information on Disney bulk, direct-to-recipient, or individual gift card fulfillment for your gift card program. Contact us here or call us at 888-472-8747 today! 1) Protect your Disney Gift Card and treat it as you would cash. 2) The Disney Gift Card is not valid for use until purchased, activated and monetary value added. 3) The Disney Gift Card can only be used at select participating locations at Disneyland® Resort, Walt Disney World® Resort, Disney Cruise Line, Adventures by Disney®, Disney Vacation Club, Aulani, A Disney Resort & Spa in Ko Olina, Hawai'i, Disney's PhotoPass®, Disney Store locations in the U.S., Puerto Rico, and Canada and DisneyStore.com. 4) Check with individual locations for program participation before redemption. 5) At the Disneyland® Resort, the Disney Gift Card can be redeemed at select merchandise, food, ticketing, parking and Guest Service locations, as well as for Disneyland® Resort Hotel room nights. Not accepted or valid for use for room service or lockers. Not valid or accepted at fruit carts, outdoor vending locations, third party lessees, Names Unraveled, Jewel of Orleans, Silhouette Studio, Portrait Artists, Parasol Cart, Heraldry Shop, Crystal Shops, Midway games, Face Painting, Disneyland® Kennel Club, or Downtown Disney® District Operating Participant locations. Not accepted at parking lots at Disneyland® Resort Hotel or Downtown Disney®. 6) At the Walt Disney World® Resort, the Disney Gift Card can be redeemed at select merchandise, food, ticketing and Guest Service locations, select third party lessees and Disney Springs® District Operating Participant locations. The Disney Gift Card can be redeemed towards payment of Walt Disney World® Resort Hotel room nights or reservations. 7) Except as required by applicable law: the Disney Gift Card is not redeemable for cash; if the Disney Gift Card has never been used for any purpose (regardless of whether the transaction was cancelled or value refunded at any time for any reason) and was purchased at a Disney owned and operated location with a form of payment other than cash, it can be returned for the full original load value to the original form of payment, provided you have the original purchase receipt. Disney Gift Card purchased at other locations will be subject to the return policies specified by those locations. Partial balances cannot be exchanged for cash. Products and services purchased using a Disney Gift Card will be subject to the return policy of the applicable location of purchase. 8) The Disney Gift Card cannot be replaced if lost, damaged or stolen without required proof of purchase and complete gift card number. 9) The Disney Gift Card may not be resold in any manner whatsoever. 10) The Disney Gift Card may not be used towards the purchase of any gift certificates or gift cards. 11) The Disney Gift Card may not be used towards the purchase of a real estate interest in a Disney Vacation Club Resort. 12) The maximum purchase, reload, and total balance of any Disney Gift Card is $1000.00. 13) All amounts loaded onto your Disney Gift Card are denominated in U.S. dollars. 14) If you make a purchase in Canada with this card, the transaction total will be converted from Canadian dollars to U.S. dollars and deducted from your Disney Gift Card’s balance. Although the actual balance of your Disney Gift Card is kept in U.S. dollars, the balance shown on the receipt for your Canadian transaction will be in Canadian dollars. Currency conversions are based on currency exchange rates applicable on the date of the transaction, and no fees are charged for the currency conversion. 15) The Disney Gift Card is issued by Disney Gift Card Services, Inc. ("DGCS"). DGCS reserves the right to modify, alter, amend or change the terms and conditions of program without advance notice. The Disney Gift Card can be used at select participating locations at Walt Disney World® Resort, Disneyland® Resort, Disney Cruise Line, Disney Store locations in the U.S., shopDisney.com, Disney PhotoPass™, and Adventures by Disney®. Visit DisneyGiftCard.com for complete terms and conditions.